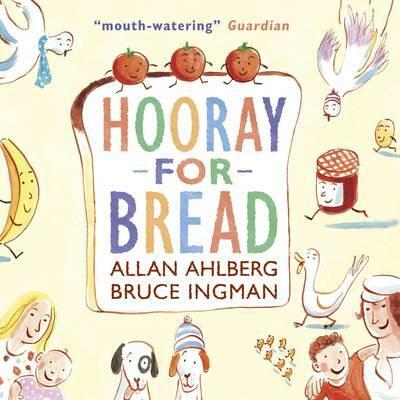 From the team that created The Pencil and The Runaway Dinner comes a calmer and perhaps slightly less eccentric story that all carb lovers will salivate over - all together now we shout "HOORAY FOR BREAD!" With wonderful rhyming text that flows smoothly, and plenty of bakery puns, Hooray for Bread follows the journey of a freshly baked loaf of bread. From the first piece of crust cut and eaten by the baker as the sun is rising, to breakfast in bed for the baker's wife (on a tray in bed - lucky woman! ), a sandwich for the baker's son, beans on toast for the family's lunch, and toast soldiers with boiled eggs for dinner. There are also scraps for the dogs, crusts for the ducks and crumbs for the birds throughout the day. As we follow each part of the journey, the story builds to a delightful shout of "Hooray for Bread!" which human and animal characters both join in on (and which kids reading will probably want to join in on too!). While still showcasing Bruce Ingman's distinctive illustration style, I found Hooray for Bread to somehow be softer and much warmer than his other books, which worked amazingly well in conjuring up the sights and smells of a nice, soft and warm freshly baked loaf of bread. Mmm, heavenly!